Today quail droppings as fertilizer is rarely used. This is due primarily to its high cost. New technologies and the production of mineral fertilizers allow feeding much cheaper. But if you have the farm has quail, their droppings can be an excellent fertilizer for the garden. Quail manure is much better chicken. It is superior to the droppings of chickens in many ways. It is composed of are necessary to fertilize the soil substances as nitrogen, phosphorus and mineral compounds. Also it contains abundant organic matter that allows to nourish the soil after a single application within three years. The trace elements contained in quail litter, easily absorbed by plants. In this regard, the plant quickly gaining height, stem and leaf mass and form fruits. Also quail droppings promotes rapid ripening and protects plants against soil diseases and infections. As well as chicken, quail, fresh droppings make the soil impossible. Organic matter it contains uric acid, which is depressing, "burns" plants because it is a potent toxin. Especially detrimental effect fresh quail litter on the germination and seedlings of vegetable crops. And adult plants if they are fed fresh litter, give no edible fruits due to high content of nitrates. 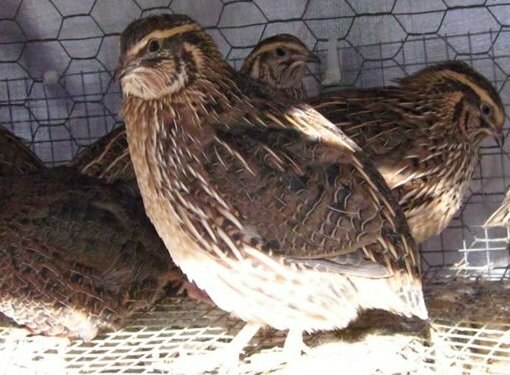 Therefore, before fertilization quail droppings must be prepared to use. For processing quail manure must be composted. Need to he have lain down and perepel, but under the open sky leave it is not recommended as a useful nitrogen compounds very quickly evaporate. So the ideal would be to fold it into a compost container. The quail manure composting can be carried out in a special container for composting or in an old barrel. In the capacity of alternately laid the litter layer 20 cm layer of chopped straw or sawdust – 30 inches. Sawdust and straw will absorb the nitrogen, which will allocate quail droppings in the process of digestion, and saves it in the fertilizer. If litter and a layer of sawdust or straw is dry, you need each layer is thoroughly wet. The last is a layer of sawdust or peat moss. Top compost container is sealed with a lid or foil. In this state, the litter should be 1-2 months. This time is sufficient to neutralize the effect of harmful substances contained in fresh litter, and turn the layer into a high quality humus. Making compost immediately after preparation. Better to do it in the fall. Apart from composting to feed plants during summer you can use a liquid fertilizer from manure. Quail droppings are infused for a week with half water in a closed container. Then, the resulting liquid is discharged, diluted with water 1:20, and it watered the plants at the root. Before making the prepared quail manure should be mixed with chopped straw, sawdust or peat in the ratio of 1:1.